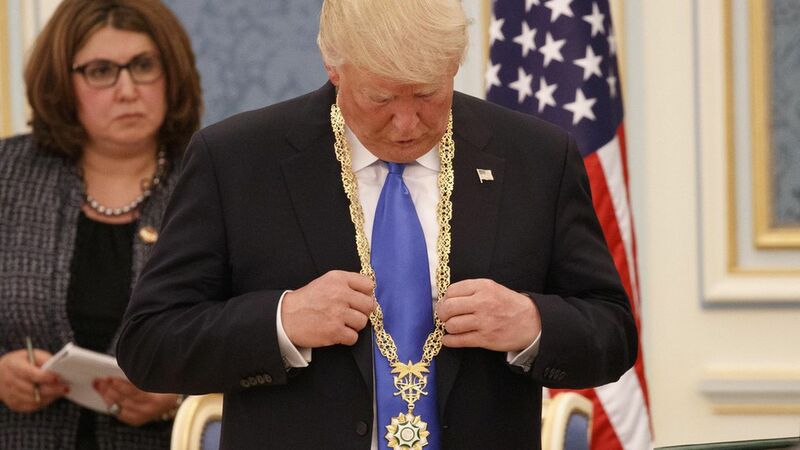 A photo roundup of the ceremonies President Trump has taken part in on his first foreign trip, and the gifts he has received. What happens to the gifts? For a while, Congress had to approve foreign gifts before they could become property of the President, but since 1928, all foreign gifts go to the National Archives, according to the Atlantic. In Saudi Arabia at the end of last week, Trump had the opportunity to participate in a ceremonial Saudi sword dance. He also touched a glowing globe during the opening of the Global Center for Combating Extremist Ideology. The Saudi king gave Trump this gold medal — the "Collar of Abdulaziz Al Saud" — which is the highest civilian honor. Trump caused a bit of a stir by bowing before the king as he received the honor. On Tuesday at Israel's Yad Vashem, Trump was presented with a replica of Ester Goldstein's personal journal. Goldstein was a victim of the Holocaust. On Monday, Trump became the first president to visit the Western Wall in Jerusalem. Beforehand, Trump was shown a map of the Western Wall. On Wednesday, Pope Francis gave Trump a copy of his 2015 encyclical on climate change and Trump presented the pope with a first-edition copy of Martin Luther King Jr.'s writings.